Rocky patiently watched the picnic proceeding at a leisurely pace below. Lots of interesting treats down there for a clever raccoon. The people would be no problem, of course. People were always easy to handle. They have terrible reaction time and most of them can’t even outrun a bear. Use the comment section below to submit your entry. Entries will be accepted until 5:00 PM Pacific Daylight Time on Tuesday, November 20th, 2012. The raccoon was so entranced by the scene that he didn’t notice the beam of fluorescent white light that struck him from the sky. It enveloped him and, though he didn’t know it, the power of the beam was quickly rewiring his brain – strengthening the neural pathways and uploading information. After a few seconds, it was done. 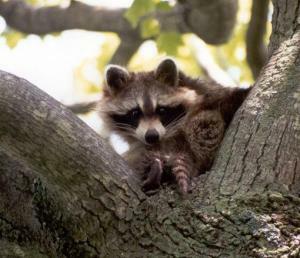 The raccoon quietly fell from the tree into a soft mound of leaves and pine needles. He stood up and looked around the forest possessively. “I’m the smartest thing in this forest … and on this whole planet! This is a new beginning for Raccoonkind! I shall lead them to their proper place at the head of the food chain! So swears … Doctor Raccoon!” And he headed off to hotwire the car of the humans. The banded warrior watched them go, the dog leading. Rocky inched down the tree trunk. The grass hid him well; autumn was his friend with all those browns and oranges. He swore the white dude snickered. Oh no, Rocky thought. Don’t climb the tree, boys. DON’T CLIMB UP HERE! But it was too late. Clark and Ollie were on their way up, with that silly bird dog yapping at their heels below. There was nowhere for Rocky to hide. “Let me see, let me see,” Ollie whined, as all little brothers are obliged to do. Rocky tried to decide what he should do. The big kid was only inches away now, and he was munching on a sweet-smelling candy bar. Rocky started to drool, despite himself. Just as Clark turned to look at Ollie, Rocky reached out and snatched the candy from the boy’s hand. I got it! Rocky thought, and in a flash he was sorry. It was so sticky! How could people eat stuff like that without washing it first? Don’t their mothers teach them anything? He threw the candy as far as he could, and the dog ran after it. Rocky took the opportunity to scamper down the tree and escape into the woods. His first stop was at the river, to wash his hands. Rocky had no time to hide, much less shove little Stripe under his chest. Her wee tail still stuck out like a sore thumb. And that white menace had his forelegs up against the trunk and made more noise than a whole pack of coyotes. Stripe struggled under Rocky’s chest. A small rump wriggled free. Before Rocky could react that rump, followed by the rest and fell to the ground. The landing didn’t hurt, what with all that fur, but the dog was on her in a flash and had her by the scruff. Rocky descended faster than a bullet. He lunged at the dog, teeth bared, growling. The dog, knowing when to cut his losses, let go, and with a sharp yelp, took off, tail between his legs. Rocky positioned himself between Stripe and the crowd of picnickers that had begun to gather, fur standing out straight, poised, ready to take on any who approached. “Dad, it’s a kitten. He’s going to hurt it.” Tears streaked Stella’s cheeks. That was enough for Rocky. He wriggled back, still facing the crowd, took Stripe in his teeth by the nape and scrabbled back up the tree. There he tucked her firmly under his belly again and dared anyone to challenge him. “I think she’s been adopted. We’d better go.” Dad led the others away. Stripe was safe with Rocky once more. Next Next post: Is Anyone Listening When I’m Not Here?